I am currently reading a really wonderful book. 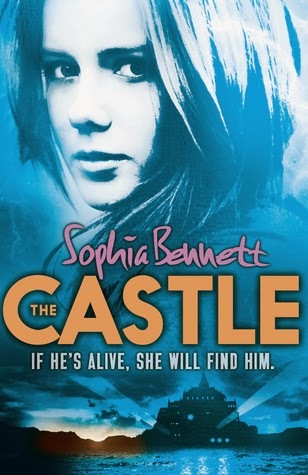 It's the latest offering from Sophia Bennett, one of my favourite UKYA authors. It's a little bit different to her previous books, in that it's an adventure story about a girl trying to find and rescue her dad, but I think it's pretty special. Today, I bring you an extract from the book for my stop in the blog tour. I hope you enjoy! I stared up at the gleaming windows, willing someone to look out – some face to give me a clue as to who was inside. But the house was dark behind the shining glass. After another five minutes, a man came up the basement stairs, struggling with an old-fashioned, upright trunk. He put it on a trolley and wheeled it up the ramp into the van. He was straining under the weight of it. Were the Wahools moving out? Or just going on holiday? Either way, these were clearly not people who stuffed their clothes into the nearest rucksack and hoped for the best. However, one other thing seemed certain: for the moment, at least, the family was here. Of all the places they could have been, I was right – this was this one. Was there a cell in the basement, I wondered, near the underground swimming pool? After one simple coach ride, could I really be so close? Dad? Are you a prisoner behind those walls? I shivered. The air seemed to shimmer. The house, so close, seemed impossibly distant and impregnable. It was eerily quiet. Apart from removal guys, there didn’t seem to be anyone about. The only sounds were birdsong and passing traffic, and a pneumatic drill going off somewhere in the distance. A black cat jumped on to a nearby wall, curled its tail neatly around its paws and watched me. I couldn’t stop thinking that Max Wahool could be inside right now, which meant Dad was there too. I couldn’t imagine how, or why. Or rather, I could imagine a million scenarios, but none of them made sense. My muscles were cramping from all that crouching by the jeep. There’s only so long a girl can pretend to tie her non-existent shoelaces. Even the removal guys seemed to have given up for a while. I straightened up and checked my watch: 12.15. Perhaps they’d gone for lunch. It seemed amazing that they should leave the van open like that, shutter up, with the ramp leading into it, but they had. I got a prickle down the back of my neck. The house looked impregnable, but the van was wide open. I could hear Luke in my head, screaming at me not to, but the thing was ... maths. The statistical probability of me making it into the van, finding out something useful about the Wahools and getting out safely was, oh, about ten per cent. Or maybe five. Or – the more I thought about it – one. But the family was moving, it seemed, and the chance of me ever seeing Dad again if I didn’t do something, now, was zero. Absolute zero. That’s how it felt to me. And I was the only one who cared enough to try. This was my chance. The only one I’d get. So I ran. I was panting by the time I got inside, and I instantly knew I’d made a mistake. The van was half empty. There was a clothes rail to one side, next to the steamer trunk, and some antique chairs and tables held in place with ropes and blankets near the back. What could I possibly learn from trunks and clothes rails? But beyond them all I could just make out one other thing: an ornate writing desk with lots of drawers. Drawers could be full of papers. I ran over to it as fast as I could. Only one drawer opened and it was empty. I tried the others. Maybe I’d find a letter mentioning Dad, or a photo, or something connecting them, or ... But even as I desperately tried each new drawer, the possibilities seemed increasingly unlikely. You have the power to be way over-optimistic, Peta Jones. Anyway, the other drawers didn’t even budge. Of course they didn’t budge. Why had I ever thought this was a good plan? Oh, wait – I never had. That’s when I heard voices coming up the basement steps. The removal men, both of them, this time. Perfect. It was as if they’d been waiting specially for this moment. My eye fell on a clothes rail, packed with garment bags. It felt as though the beating of my heart was powerful enough to catapult me through it. I ducked behind the bags and rearranged them in a solid mass in front of me. Thank God the Wahool family had loads and loads of clothes. ‘You seen what’s in this one?’ the first voice said, in an Australian accent, tramping up the ramp into the back of the van. The men arranged their boxes in the middle of the van and disappeared again. Somehow, they hadn’t heard my heart pounding. I could have gone at that moment. Should have done. But I was busy trying to think of excuses. What would I say if they caught me? I’d tell them I lived nearby. I’d say I was curious. I’d say my cat had jumped inside and I’d come in looking for him. But before I could move, I heard more steps on the ramp. This was someone new, and big. The van shook as he entered. I could smell his aftershave – it was strong, like lemons. I made a tiny gap between the clothes bags to peep through. Despite the thud of the new man’s walk, he wasn’t bulky like a rugby player; he was like the men in Dad’s old regiment who were experts in judo and karate. His body was lean under his business suit, but solid, and his head was shaved. You could just tell he could beat you in a fight (not only me – obviously he’d beat me – but even someone tall, and mean, and trained). He radiated calm efficiency. This was not a man you made excuses to. Holding a shallow black box in one hand, he approached the desk. He opened the one drawer that would open, felt around for a minute and took out a key. The key opened the central drawer. He put the box inside, locked the drawer and replaced the key in its hiding place. Then he left. Outside, I heard him call sharply to the removal men. ‘One of you’s always looking after the van, right?’ He sounded brisk, authoritative. ‘Yup,’ an Australian voice assured him. Oh great. So now they were turning all conscientious. I waited for a few more minutes, then peeped through the clothes to see if they were still outside. Even if they were, I’d use the cat excuse on them and run. It was better than staying here. At that moment, a car pulled up behind the van. A Range Rover. Dark, with blacked-out windows. I peered into the light and adjusted my vision. The driver’s door opened and a woman got out. Ingrid – the Wicked Queen. Right here. Right now. Right in front of me. My heart beat so fast I thought it might blow itself up. Stupid idiot, Peta Jones. You went straight to them. ‘I left him there,’ she said. Her accent was clipped and sounded German now she wasn’t trying to hide it. I watched her through the garment bags. ‘Does he have the kid yet?’ Muscle Man asked, coming into view. ‘Conspicuous,’ Muscle Man said. ‘Yes, I can see that.’ He sounded unimpressed by her grasp of English, and also her grasp of kidnapping. He laughed at that. A short, sharp, satisfied laugh. They walked out of sight, but as they did so, the removal men came back with more bags and boxes. They made a couple more trips while I hid as far into the shadows as I could. I waited for everything to go quiet again. I was ready to run as soon as the coast was clear. What I wasn’t ready for was for one of the removal guys to come back, pull down the shutter and lock me in the dark. I wasn’t ready for the engine to start up and the van to move off, with me inside it. I wasn’t ready for that at all.